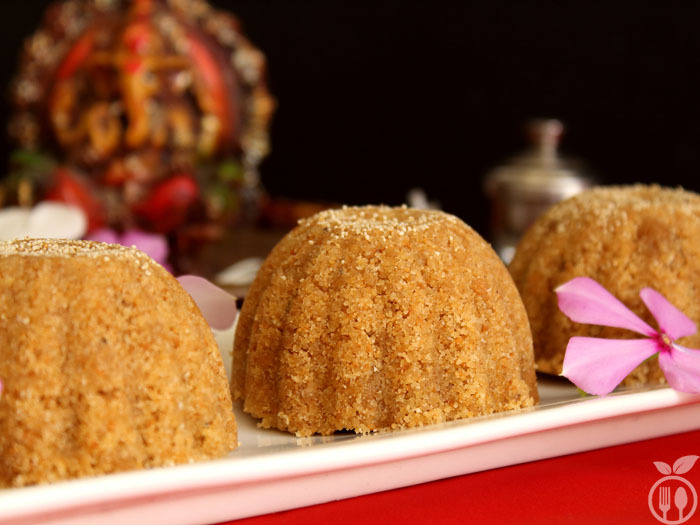 Churma is the authentic sweet recipe from Rajasthan, the neighbour state of Gujarat in India. It is basically a sweet prepared from jaggerey, ghee (clarified butter) and coarsely ground whole wheat flour. Being a neighbour states, Gujarat and Rajasthan seems to have many similarities in their traditional food and culture. And that can be seen pretty well from the recipes of Churma (Rajasthan Speciality) and Churma Ladoo (Gujarat Speciality). 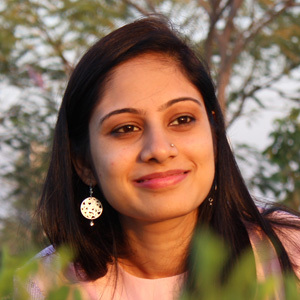 The meaning of “Ladoo” or “Laddu” means round ball. There is saying that lord Ganesha always loves ladoo, either it is made from whole wheat or rice flour or any other ingredients. In my family, we make this ladoo at lord Ganesha birthday (Ganesh Chathuthi). I usually don’t find this ladoo in any shops those are famous for their authentic Indian Desserts. And who have tasted my ladoo, they always said that this is real and traditional ladoo. 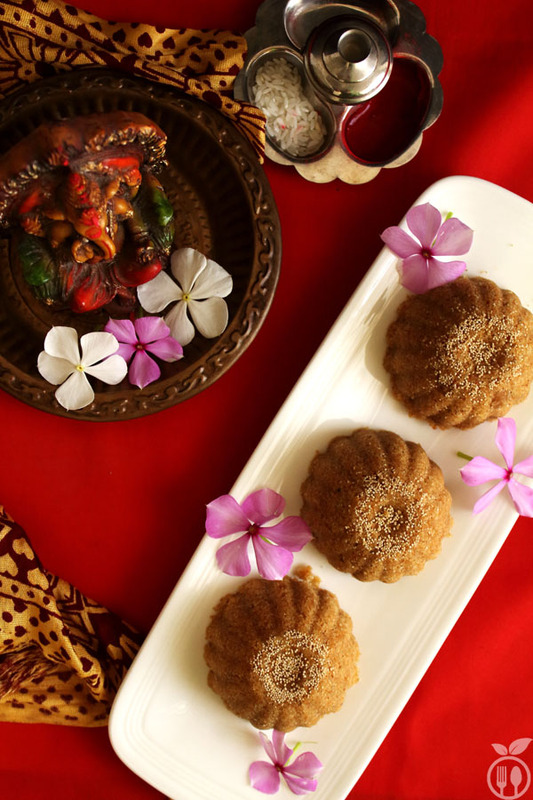 The main ingredients of this recipe is whole wheat flour, ghee and jaggery. This is again 3 ingredients recipe. I have made 2 more recipe using these same 3 ingredients: Whole Wheat Halwa and Sukhdi Recipe. When I am saying Authentic, I mean it, because, this is my mother’s grand-mother recipe. So, this secret recipe is not going to be secret anymore. So, when you want perfection, you have to follow the procedure and proportions. I know, this is time consuming recipe, but I must say, all kitchen work is worth it, when you taste it. Now, you need to add oil for shortening (moien) into flour. Mix them using your finger tip. It will be breadcrumb like texture. After that, add warm water, please use warm water, and add it as required. We don’t have to knead the dough. You just bind the flour together, and make dumplings. You can give any shape here. But be careful, they should be thick. Prepare all flour dumpling by adding water as required. And then, you have to fry them into oil. You must have to fry them in low flame of gas till it turn golden brown. It may take around 5-7 minutes to cook perfectly. At last fry them on high flame for 1 minute for good result. Then let them cool completely. Then crumble with hand and make small pieces and put them into mixture jar. And grind it till you will get smooth mixture. That smooth mixture is called “churma”. 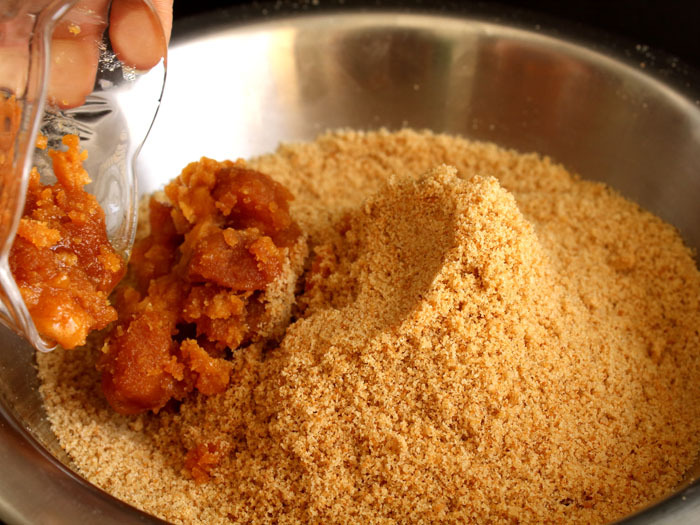 Add jaggery according to proportion and mix jaggery using hand. 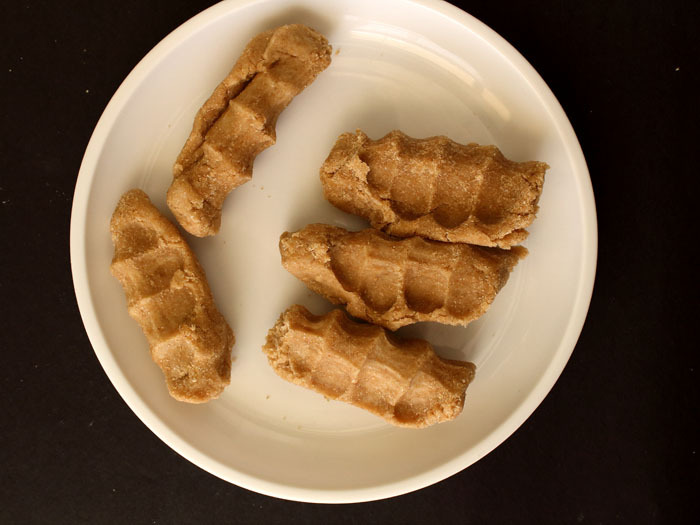 Be sure jaggery is perfectly mixed with churma. Heat the ghee in pan on medium flame. It must be hot enough so that when you pour it in the mixture, you would see a grid of bubbles on the surface shown in figure. If you pour ghee, and you will not get bubble grid, again heat the ghee and then add it. Then after, let them cool for a while. Now add 2 tbsp powdered sugar. This is optional, But it will enhance the taste of ladoo. Now add nutmeg powder and cardamom powder and mix them well. You can add dry-fruits (almonds, kismis, cashews) at this stage. Make sure that you add cardamom powder only after adding ghee. This will preserve the aroma. Then you can give any shape to your ladoo. You can also use mold for making churma ladoo. But I always prefer the round shape. In one plate, take poppy seeds, Once you make one, immediate roll them into poppy seeds, so that they get stuck with hot ghee. Using finger you can also apply it. The type of wheat flour is very important. You have to use coarse wheat flour (dardara atta). There is another option if you don’t have coarsely grinded wheat flour. 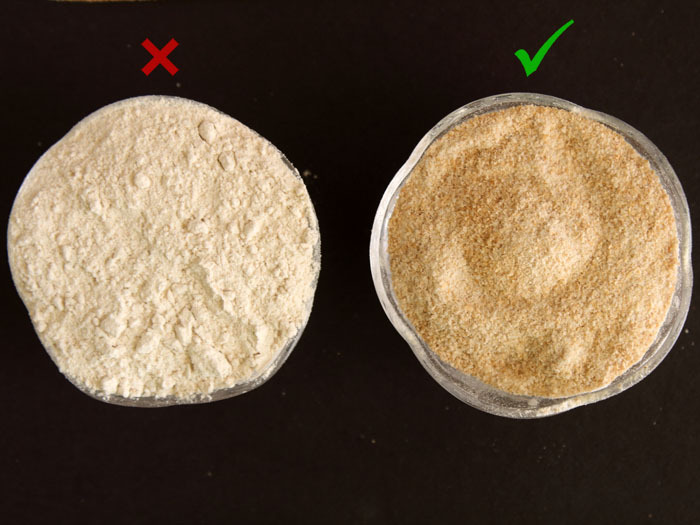 You can use regular flour, but add 1/3 part semolina (rawa, sooji) into it to get coarse texture. You need to use warm water to make dough. And use water as required to make dumpling one by one. Meanwhile if water become feels cold, then again make it warm enough. Use very less water just to bind flour. 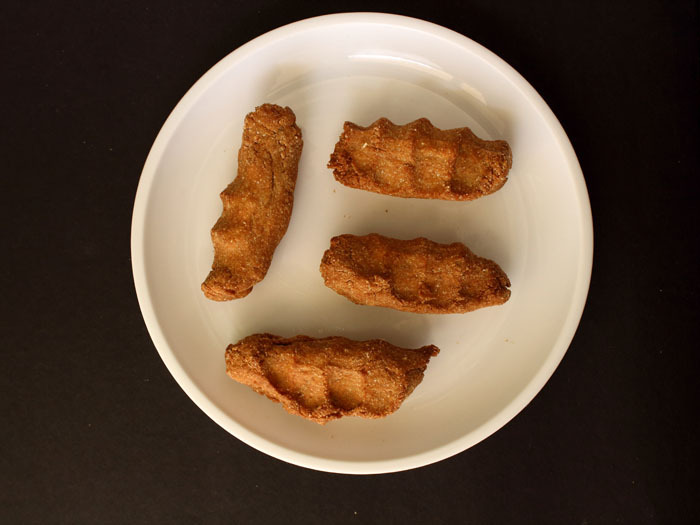 You can give any shape for frying it. But make flatten shape. So when you fry it, it will also cook from inside. You have to be patient while frying it. Fry them on low flame for 5-7 minutes. And once it turns into golden brown, fry it for half minute on high flame. Let the dumpling completely cool down. If you use hard jaggery then, finely chopped it. And then mix it. This authentic gujarati churma ladoo is my most lovable authentic sweet recipes in India. I have presented step by step process which gives you original way to create proper traditional Gujarati Churma Ladoo recipe. Take coarse whole wheat flour and add oil for shortening. Mix them using your finger tips. It will be breadcrumb like texture. Then boil the water. And add warm water to make a dough. No need to knead the dough, just add enough water to bind the flour and give any shape. You can give any shape but it should not thick. Petty like shape is also good. Create one by one churma dumplings. You need to fry it, on very low flame for at least 5-7 minutes. At last fry them on high flame for half minute. Then using hand or some pestle first make small pieces and add them into mixture jar. Finely grind them. If any chunks remaining, then re-grind them. Mix the jaggery very well into churma mixture. Meanwhile heat the ghee in a small pan. Add the hot ghee into churma ladoo. The ghee is hot enough that bubbles are generated and you will get some honeycomb like texture into mixture. First add little ghee, if bubble is not generated, heat ghee again and verify the texture. Once you add ghee, then only add powder sugar, cardamom and nutmeg powder. Mix all with spatula. You can use ladoo mold to make ladoo. Or take some churma mixture and give a round ball shape using hands. 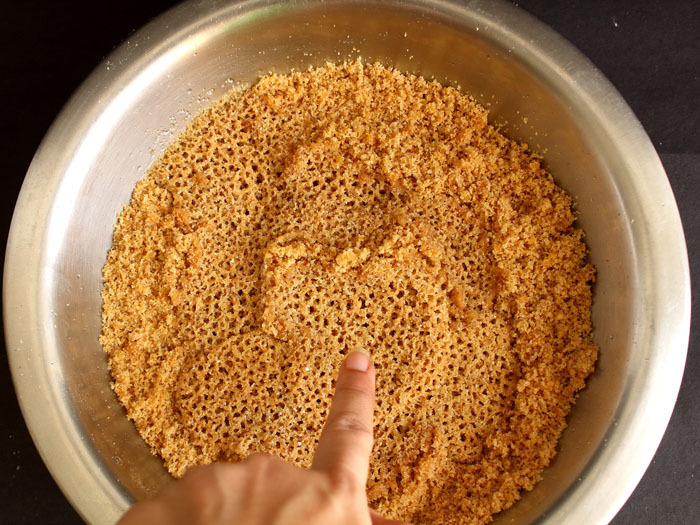 Immediately spread poppy seeds so that they will stick to churma ladoo. 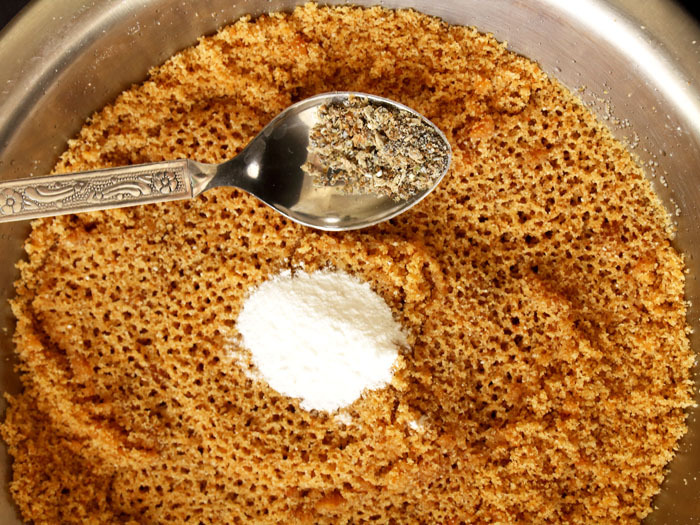 Once ladoo surface is cooler or harder, poppy seeds cannot stick with it. You can serve with any complete meal. But one laddo alone is enough for me. 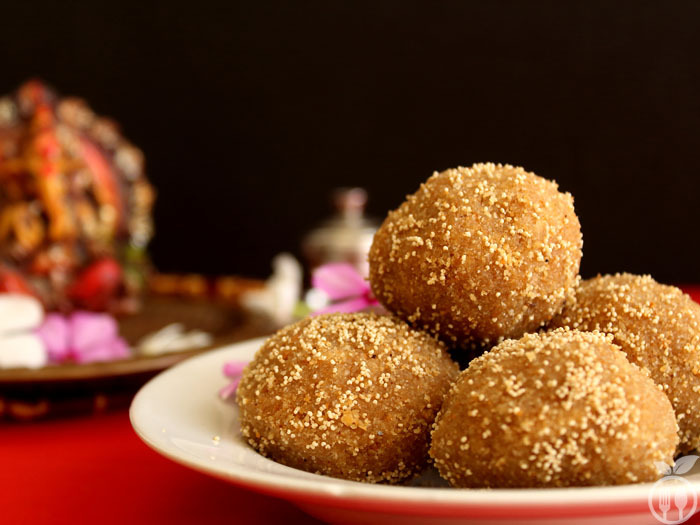 1) You can store this churma ladoo in air-tight container for 15 days at room temperature. No need to refrigerate them. 2) Potato curry, Roti (Indian Flat Bread), Dal (Lentil curry ) and Rice is perfect complement with this dessert. There are different variations of this dish. Many people will make roti from whole wheat and then add jaggery, ghee into it. 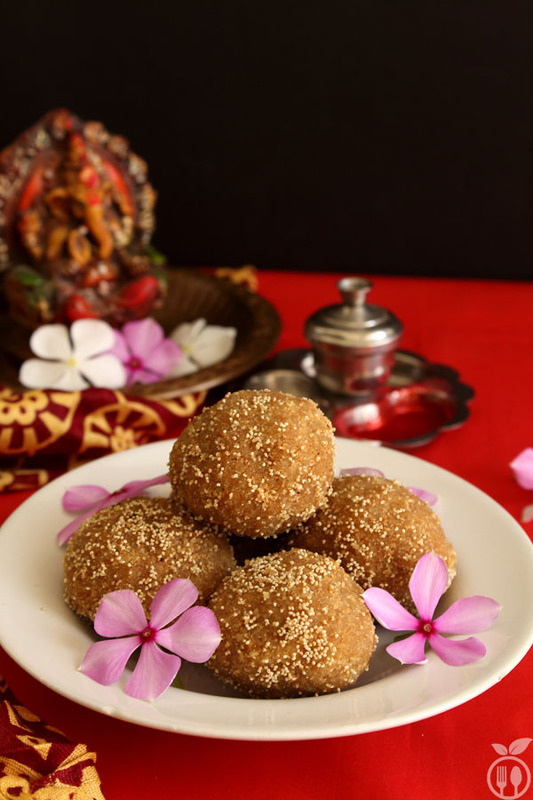 Some even fry churma dumpling into ghee, and then boil jaggery into ghee, and combine them and make ladoo. Try whatever recipe method you are comfortable with, but at the end, you will get the master piece. very well detailed and pictured recipe..nice work !! Can I make this recipe with Aashirvad atta?? what if you want to take sugar instead of jaggery how much should be quantity of sugar to 3 cup coarse atta? Hi kinnari, you can use powder sugar instead of jaggery. Proportion must be 1/2 of atta, means 1 1/2 cups powder sugar. Again it’s vary by your taste and sweetness of sugar. thanks. this is so nicely explained specially avoid mistakes part..
my gran used to badam, pista & kaju, if i wanted to add these to the receipe, how much would you suggest. I suggest, you can use 5-6 pieces each of badam, pista and kaju. But You can change the quantity as per your taste. I don’t like pistachio in my ladoo, so I never use it.